I pounced on this with pure glee the moment I saw it. Not only do my kids truly adore Maisy (yeah, yeah, ok, I might adore her too! ), but a book about visiting a bookstore is an absolute must read in our home. 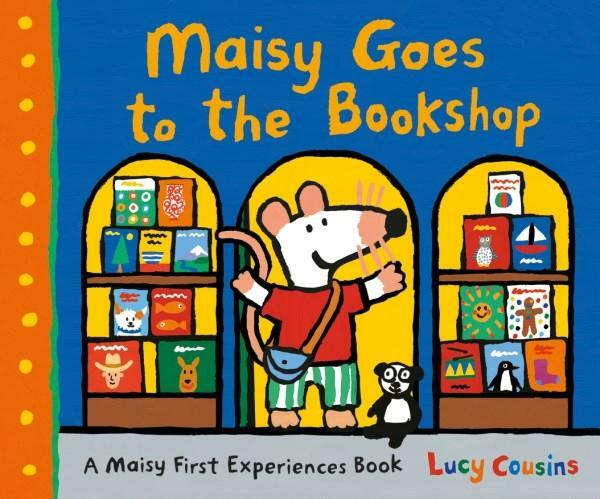 Part of the A Maisy First Experiences series, Maisy Goes to the Bookshop is perfection from beginning to end. Maisy takes Panda into the aptly named 'We Love Books' bookstore, where she tries to decide from the glorious range of titles available to purchase. She reads a few different books before getting help from Ostrich the shopkeeper to choose a book for her friend Tallulah. Maisy bumps into her friends Charley, Cyril and Eddie who are all looking at their own books and imagining out the stories that they are reading. I love the way that this is illustrated, showing each character picturing what they are reading in their mind's eye. I can imagine that it's not a terribly easy concept to illustrate, but it is done simply and it is done well. 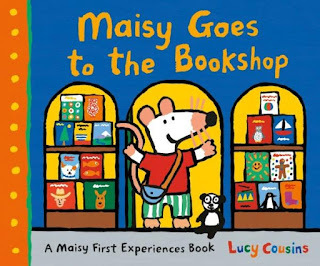 Before Maisy goes to visit Tallulah to gift her the book (notorious book gifter right here, so I loved this element as well), she joins in on story time in the bookstore, has a bite to eat at the bookstore Cafe and pays for her book purchase at the register. Pretty much, Lucy Cousins has managed to write and illustrate the story of my dream day out! The simplicity of the text, the vividly bright colours and bold lines of the illustrations, and the inclusion of real world experiences all combine to create completely captivating storytelling for 1-6 year olds, while encouraging a value of books and a love of reading as a shared activity.